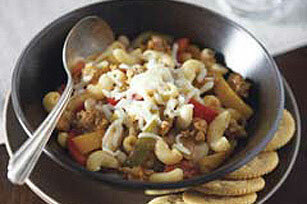 Get the dinner entrée on the table quickly with our Easy Italian Stew! Hearty sausage comes together with veggies, beans, and more in this Italian stew. Heat dressing in large saucepan on medium heat. Add sausage; cook 8 to 10 min. or until done, stirring occasionally to break into small pieces. Drain. Add broth, stir-fry vegetables, beans and tomatoes; bring to boil. Stir in macaroni; simmer on medium heat 8 to 10 min. or until macaroni is tender, stirring occasionally. Substitute ground beef for the Italian sausage. Stir in 1/4 cup shredded fresh basil leaves along with the broth, vegetables, beans and tomatoes. Or if you prefer a spicier flavor, stir in 1/2 tsp. crushed red pepper instead.